Disclosure: I received a gift card from Gymboree for the sole purpose of this review. No other compensation was given. All opinions are 100% my own. Spring weather has arrived, and with it, new clothes are needed. Kids grow so quickly and since my youngest three girls wear pretty close to the same size… there is not much in the way of hand-me-downs. 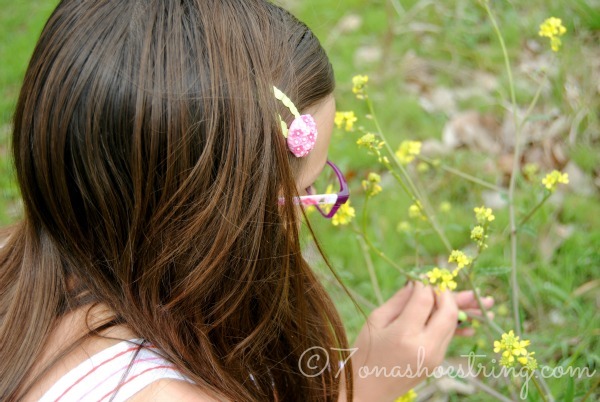 But, the Spring weather also offers us the chance to get back outside and into nature. 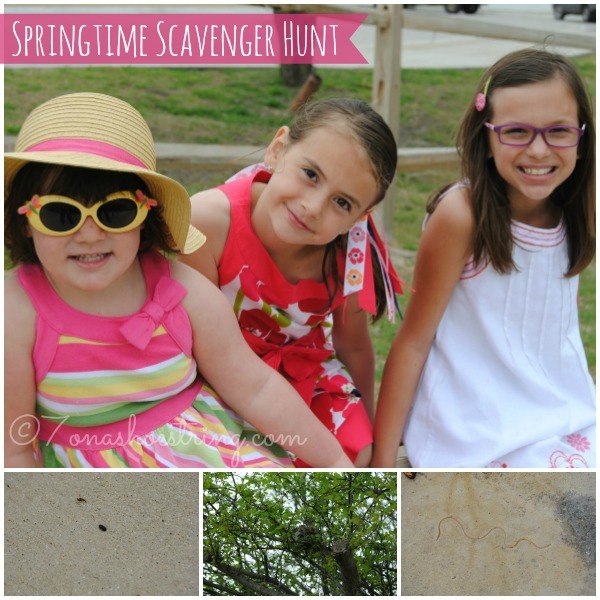 Therefore, with the joy of new Gymboree clothes and armed with a fun list, we set out with the girls on a Springtime Scavenger Hunt. 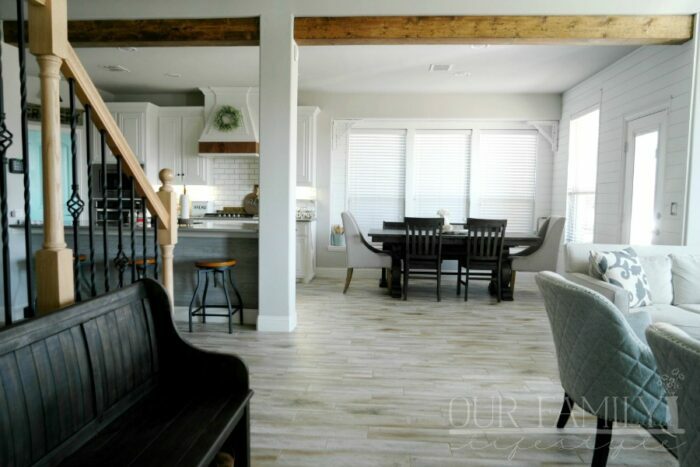 First, we sat down and decided on a few things that reminded us of Spring. After agreeing on a list, I used a design program to make a colorful checklist we could use during our springtime scavenger hunt. Next, we simply needed to decide on the perfect location, grab the camera, and head out to see what we could find! 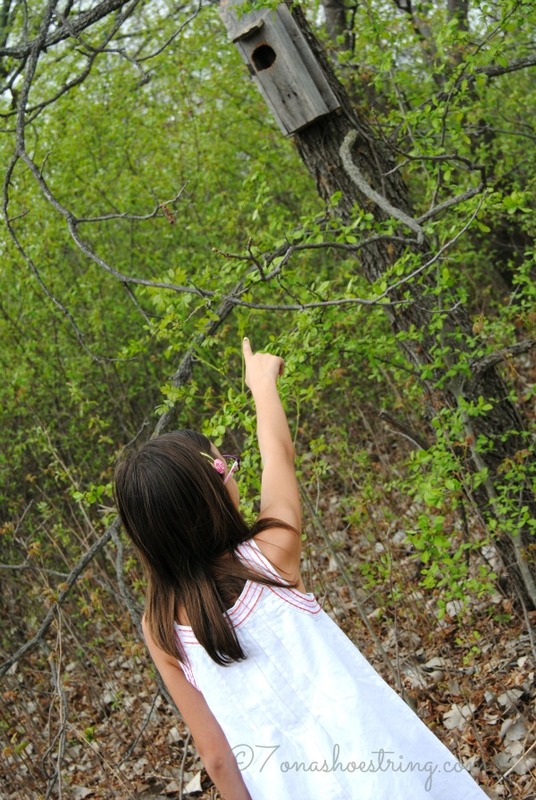 We knew that we could find several of our scavenger hunt items along the local nature trail, so that is where we began. Considering the recent rain we had received, finding water puddles was no problem. In fact, the problem was keeping Monkey away from them since she wanted to jump right in. Luckily, the insects and other fun things we found along the way kept her entertained. And she loved wearing her cool new Dragonfly Straw Sunhat and bow stripe dress. 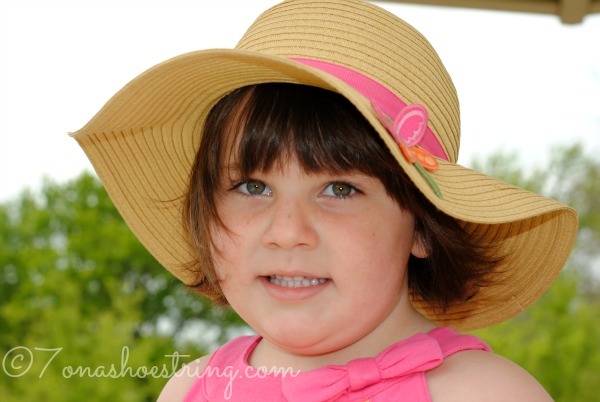 We were surprised she picked out the hat–and actually wears it often–but even more grateful since she has sun allergies and NEEDS a good sunhat for our spring activities. As we walked down the concrete path of the trail, the girls happily skipped along together. They enjoyed searching the trees and grass for hidden treasures both on and off our scavenger hunt list. Besides numerous water puddles, one of the first items we found was a birdhouse hanging in a nearby tree. JJ went in for a closer look; careful to not get her white embroidered flower linen dress from the Faraway Traveler collection dirty. The embroidered flowers on the front caught her eye at the store and she assured me she could keep it white. So far so good! She even found some Dragonfly Flower Snap Clips to match the flowers on the dress and enjoys wearing them to keep her hair out of her face. Princess simply likes to look pretty anywhere she goes. 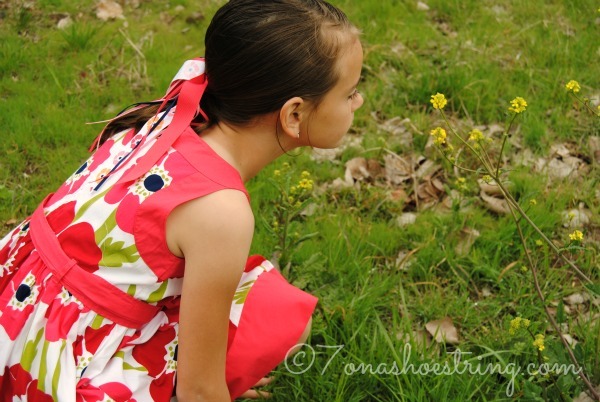 After walking circles in the store, she finally decided on the pink poppy bow sash dress from the Blooming Nautical collection. I have to admit, it looks great on her. And, of course, she was the one that found all the flowers and butterflies along the way as we checked items off our scavenger hunt. We probably only found about half the things on our list, but had such an amazing time searching. The walk was great for us. The scenery was beautiful. 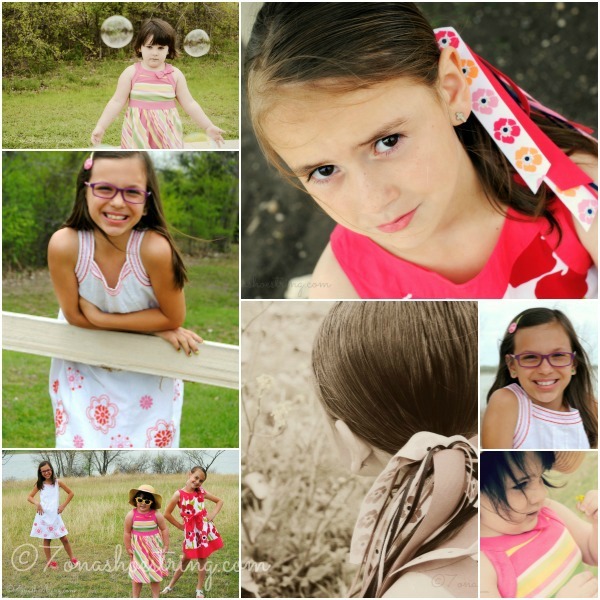 Plus, I was able to get tons of great Spring shots of the girls. 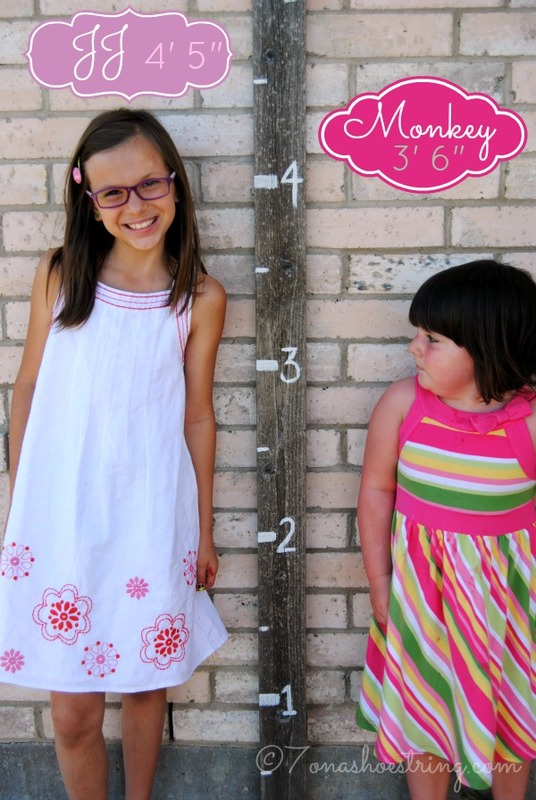 Afterwards, Colby and I threw together a quick growth chart to see just how quick the girls are growing. 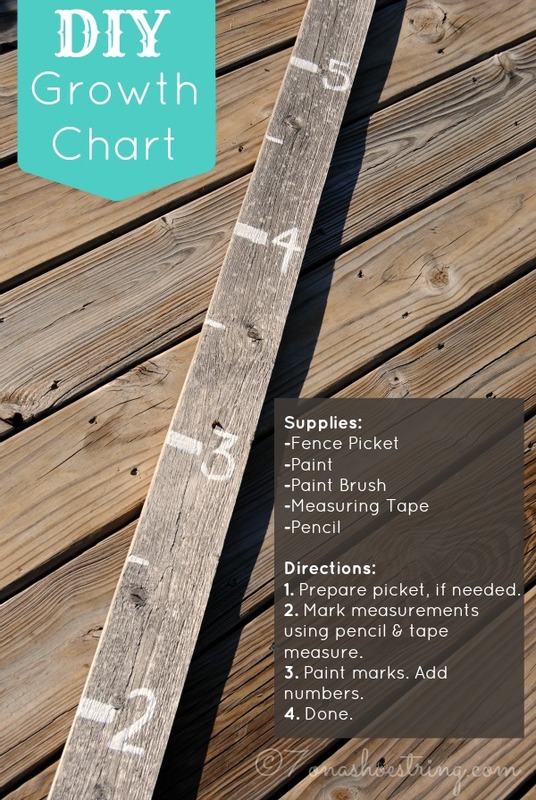 An old fence picket, tape measure, pencil, paint, and paint brush was all it took. You know me, queen of the crafts you can make from things you already have. 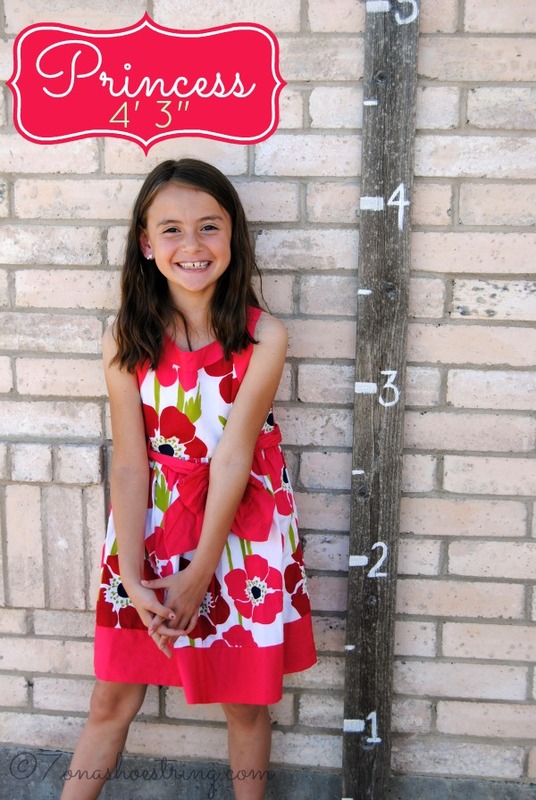 5 minutes later we had a awesome DIY growth chart. Our favorite spot in the front of the house, coupled with our fabulous new growth chart, and we had pictures of the girls we can use to compare later. 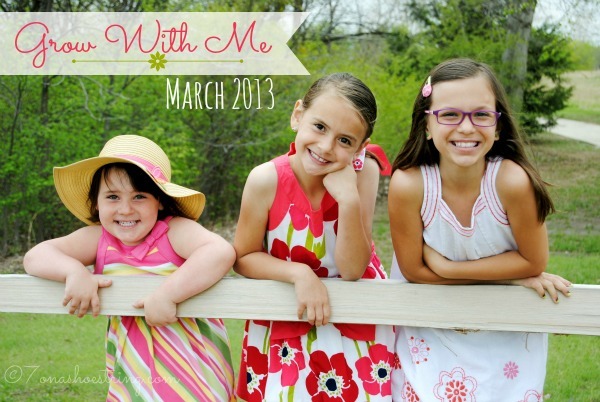 What fun Springtime events do you have planned? 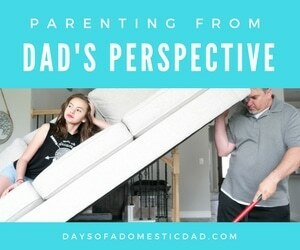 How do you chart your child’s growth through the seasons?